The prime responsibility of a student is to do his/her best job at all times. Applications to colleges and universities can be viewed as the formal presentation of a candidate for acceptance. Admissions counselors will be looking to find those people who will be the best fit for their institutions. Their goal is to admit those students who will prosper and thrive at that specific school. As a student in search of a home, the successful candidate has researched the school including the size, location and most importantly, the programs of study, and has studied the requirements as well. In brief, with the help of the family and the school counselor, a student creates a list of schools to which he/she will make application. The student should include schools in this list where the match is good academically and socially. It should also include both a “reach” and a “safety” school. A reach school is one that would offer the greatest challenge academically, and a safety is one where chances of acceptance are virtually certain. The student then formally requests that records be sent to the prospective school via a Transcript Request Form available in the Guidance Office. 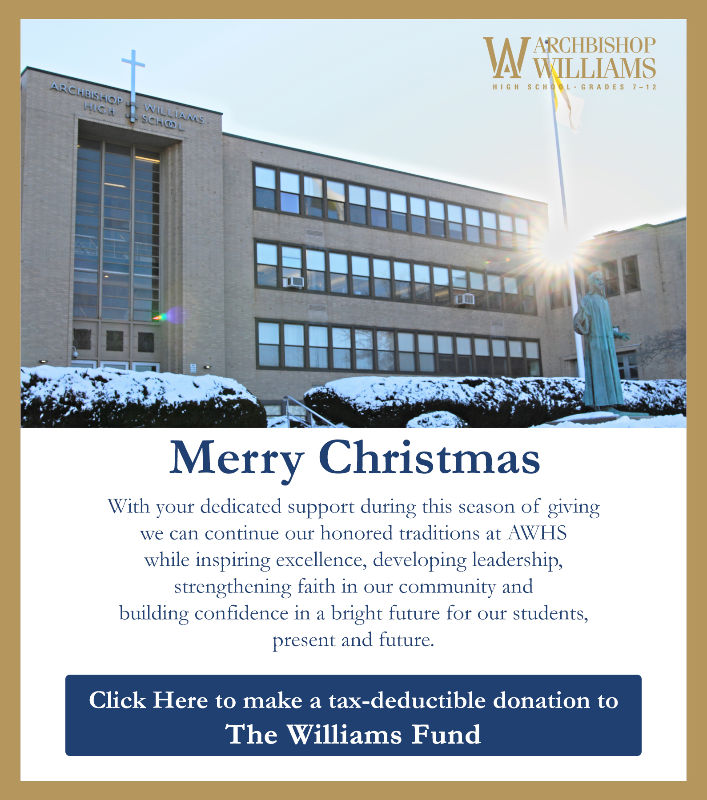 The records sent will include an official transcript of grades covering first three academic years, a current grade report, a Profile of Archbishop Williams High School, and the counselor’s, as well as the teachers' recommendations. The student is to request a letter of recommendation from at most two teachers, depending on the individual college requirements. To help facilitate this process the student is to update his/her resume on the Naviance Program as well as post his/her biography as a journal entry on the Naviance site. Teachers will forward their recommendation letters to the Guidance Office through the Naviance Program. It is the responsibility of the student to complete all parts of the official application following the specific directions as they appear on the college application, and send it along with the required fees and essays. Many schools encourage the use of the Common Application that can be completed and sent electronically. Also the student must request that his/her SAT and/or ACT scores be sent to his/her colleges from the respective testing agency. And finally, the CEEB number for Archbishop Williams High School is: 220415.
college search process and progress being made. It is not the role of the guidance counselor to choose a specific college, but it is certainly the counselor’s role to advise and assist. The office will prepare appropriate records and submit these to the student’s choice of school(s). In addition, each counselor will write the official school recommendation for the student. The Guidance Office will disseminate information through the Naviance Program regarding scholarship opportunities as they are received here at school and update the list on Naviance frequently. However, it is the student’s responsibility to pursue scholarship and financial aid, if needed. The FAFSA (Free Application for Federal Student Aid) is a critical form available online in the fall. Please note that it cannot be filed until after Jan.1. The Guidance Department schedules two very important meetings for parents regarding financial aid for college (junior year---Parents Night in May; and senior year---Finanicial Aid Program in October). During their junior year, students were provided with a suggested list of colleges with the expectation that the student and his/her family will undertake the investigation of these and other colleges. This may include on-site visits to the college and/or website investigation. It is important to remember that just as the parent is the first and primary teacher, the parent has a key role in the college selection process as well. You know your son/daughter better than anyone else. Your input and direction is essential, but it is also important to remember that it is the student who will be spending the next four years in college and he/she should have input as well. Financing higher education is a daunting task and it is therefore imperative that parents learn as much as possible about the sea of options offered for financing the cost of tuition. Most scholarship aid is college-based and deadlines for aid applications are very important. There are many websites that can offer scholarship information and recommendations, but be wary. If someone asks you for money to help you find money, look elsewhere.